The 2018 Yankees won 100 games in the regular season with first-year Mgr. Aaron Boone. They set an MLB all-time record with 267 Home Runs. They followed up Aaron Judge’s 2017 Rookie-of-the-Year honors, with not one but two R.O.Y. candidates, Miguel Andujar and Gleyber Torres this year. Giancarlo Stanton adjusted to being traded to NY and a new league by hitting 38 HRs & knocking in 100 Runs in his first season in pinstripes. Having said all that, the Yankees did not go as far in the postseason as they did last year. Boone & Stanton, the two newbies, took much of the criticism for an end to the season that made it hard to consider 2018 a “success”. 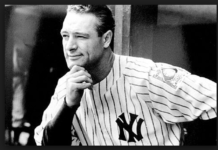 Last year the young upstart “Baby Bombers” won 7 postseason games, making it to within 1 game of the World Series! This year with the addition of Stanton (2017 NL MVP), they won only 2 postseason games. The picture on top of this column is the last at-bat of the Yankee season. Gleyber Torres made the final out of the ALDS vs. the Red Sox in game 4 at the Stadium, as Boston celebrated a 3-1 series win. It was the second time in less than a month that the rival Red Sox popped champagne corks in the Yankee’s visitors locker room, first when they clinched the division in September, and this time after winning the ALDS, as they blasted the song “New York, New York” to mock Aaron Judge and the Yankees while spraying each other with bubbly. Painful ? In the words of an ex-manager … It’s not what you want. It’s not what you want, but it’s also not hard to understand why the Yankees lost the ALDS to the Red Sox. Need a good reason? For starters … their starters. To be considered a “quality start” a pitcher needs to go at least 6 innings. No starter went that far, although it must be said that Tanaka had a solid start at Fenway vs. David Price in Game 2 , the Yanks lone win in the series. In fairness, starters are no longer asked to go deep into postseason games, but Happ, Severino & Sabathia combined for only 8 innings, while allowing 14 Earned Runs. That works out to a 15.75 ERA if you’re scoring at home. There was nothing Sweet about SIXTEEN-1 in Game 3. In fact it was about as Sour a game as you can get. NYY ace Luis Severino started warming up 8 minutes before game-time, leading to speculation that he didn’t know what time the game was starting. There was a possibility Severino was tipping his pitches. Aaron Boone was criticized for leaving Sevy in the game too long. The game got so out-of-hand that back-up catcher Austin Romine was brought in to pitch in order to save the bullpen from further use. The 16-1 shellacking was the biggest blowout loss in Yankee Postseason history. The other two loses were both heartbreaking 4-3 finals where The Yankees were atrocious with RISP in each game. The 9th inning of Game 4 was a microcosm of the problems with the Yankees offense. They were built to hit home runs, but not to manufacture runs. They are not situational. They don’t change their approach with two strikes , etc. In the 9th inning Judge walked, Didi singled, and the Yanks who were down 4-1 were set up for a rally vs. a very shaky Craig Kimbrel, with the Stadium crowd going nuts and just waiting to erupt. With 1st & 2nd and 0 outs, Giancarlo Stanton struck out trying to hit a game tying HR, as he looked to pull the ball even with two strikes. He waved at an outside breaking ball to finish his season. In the ALDS Stanton was 4-18 (.222 BA) with 0 Extra base-hits, 0 RBIs, 6 K’s and 12 runners left on-base. Luke Voit followed with a walk to load the bases. Neil Walker was then hit by a pitch to make the score 4-2. 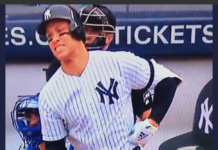 Sanchez followed, and like Stanton looked to be trying to pull a HR. Gary did give Yankee fans a moment of hope when he pulled a fly ball to deep LF but it was only good enough for a sacrifice fly. The approach should have been to work the count, and thinking to hit the ball up the middle against a pitcher struggling with his control. Take a level swing. Forget “launch angle” !! Gleyber Torres was up next with the score 4-3, now with 2 outs, and runners on 1st & 2nd. So you had 3 outs made in that 9th inning, by Stanton, Sanchez and Torres, all with the same approach. All trying to do … too much. In terms of results, it turned out to be … not enough. The Yankees traded for home-run king Giancarlo Stanton, and bragged about pre-season ticket sales being way up because of the move. We’ve heard management and manager say “we’re a home run hitting team”. They freely admit they are highly reliant on their analytics department who tell them that in today’s game, home runs matter most and batting average and strike-outs don’t. The Bombers set an MLB all-time single season home run record, yet didn’t hit a home run in the two home ALDS games. The game changes in the postseason. This is something the analytics department needs to learn. Yes, homers are hit in the playoffs, but many times by unsung heroes who the opposition hasn’t targeted as “don’t let that guy beat you”. I’ve said it for years .. batting average matters. Houston led the majors last year in batting average. This year the Red Sox led the majors in batting average. The 2018 Yankees ? They ranked 16th in B.A. & 22nd in Strike-outs. In the 9th inning with the season on-the-line, the Yankees didn’t hit a single home run, when all they really needed was … a single. 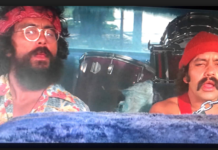 4.20 & UP IN SMOKE ?